We have tried to make things as simple as possible to setup, promote and manage your league. Click here to enter register your club and select your unique domain. Create your groups, add players and configure your league. Get people to sign up and select their teams. Sit back and enjoy the ride! Earn money through charging for teams (optional) and advertising. The first thing to do is to register your club by clicking here. This will create your own fantasy league site where you will be added as the main administrator. Quick and easy with our simple 4 stage setup guide. Within your welcome email will be confirmation of your chosen fantasy cricket league along with your chosen URL. Once you have logged in, you will automatically be taken to the initial setup page where you will enter your first season. Each completed stage is clearly illustrated, allowing you to easily see any steps that you havent yet completed. Social Media, Email, Word of Mouth. Now you have your funtasy cricket league set up with Funtasy Cricket, you can begin to promote your chosen URL through any number of channels. Let as many people know the website link to your league as possible. Share your link on Facebook, Twitter and any other social media channels you may have. Email your friends, email your colleagues and tell as many people as you can about your new league. This will ultimately ensure its success and make it as much fun for everyone as possible. 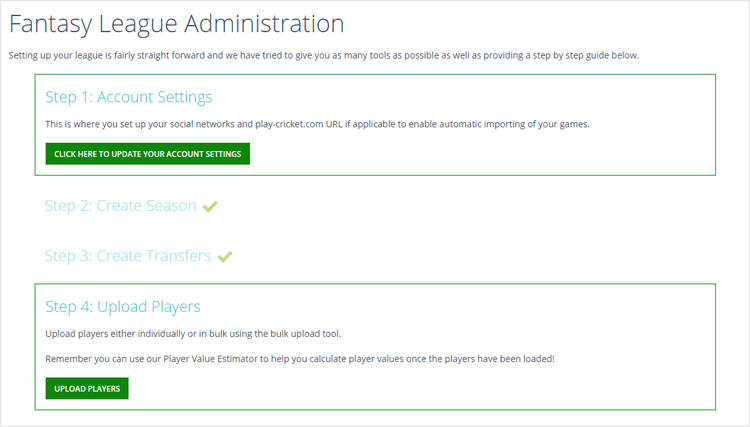 Funtasy Cricket also has the ability to link directly to your Twitter account allowing you to effortlessly promote your league with the click of a button! Thats right. YOU can earn money from YOUR funtasy cricket league. Why not follow us on our social media pages to keep up to date with all the latest news and features.